Gok’s 2016 shows include ITVBe’s Fearne and Gok – Off the Rails, and Gok’s Lunchbox on ITV. Gok also presents a regular fashion segment on ITV’s This Morning. Gok Wan has hosted three series of Gok’s Fashion Fix (Channel 4) with a follow on series called Gok’s Clothes Roadshow; Get The Look For Less (Channel 4). And for all those lonely hearts out there looking for love and a makeover, Gok did not disappoint with his 2013 series Gok’s Style Secrets (Channel 4) giving women countrywide the confidence to get back on the dating scene in style! Gok Wan presented a Polish TV Series called Stylowe Rewolucje Goka (‘Gok’s Style Revolutions’) for TVN. It aired in Poland in September 2014 and was similar in format to his UK show, How To Look Good Naked. In 2012, we saw Hotel GB brought to life with many a Gok-tail served as Mr Wan took bar-tending duties by the scruff of the neck. We also saw Gok exploring his family’s roots and what it means to be an Anglo-Asian in his 2013 documentary Made in China, where he discovered, amongst other oddities, how the abacus is still going strong in Kowloon and how a town has dedicated itself to the production of denim. He has also filmed a moving documentary on child obesity Too Fat Too Young and explored the modern day issues our teenagers are facing including sexuality, online-bullying and eating disorders in a three-part series called Gok’s Teens: The Naked Truth. Bringing something fresh and different to our screens has become Gok’s signature. 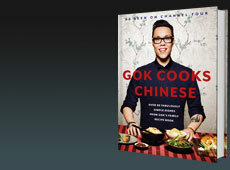 To add to his growing repertoire of shows, Gok went back to what his family does best in his 2012 cookery show Gok Cooks Chinese. 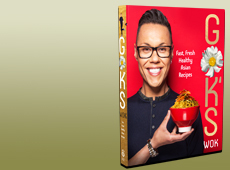 Here we see Gok dispel the myths of Chinese cookery and explore what dishes you should really be eating in your Chinese takeaway! His on screen triumphs have led to six book deals, including his autobiography Through Thick and Thin, as well as the accompaniment to Gok Cooks Chinese – so pick up your chopsticks and get some real Chinese home cooking happening in your kitchen. Furthermore, Gok has also been paid the unlikely compliment of “… man I’d be most likely to leave my husband for”, and “Ultimate celebrity bridesmaid!” Remarks that, when you consider his personable screen manner, workable take on fashion and innate ability to make women look and feel good about themselves, suddenly takes on substantial rationale. He has now crystallized his position as a true champion for women with the launch of his own women’s wear range for Sainsbury’s, with his 21st collection launched on 10th Nov 2015. Released to critical acclaim, it went on to break UK sales records in 2011 allowing women up and down the country to fulfill their dreams and get well and truly Gok’d! 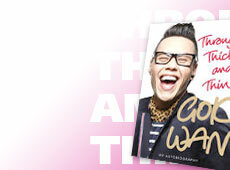 Born on the 9th September 1974 in Leicester, Gok has worked in the fashion industry for the best part of a decade. Studying at London’s prestigious Central School of Speech and Drama, he found himself drawn to hair and make-up over drama, prompting his entrée into the fashion industry and gaining him early work as a hair and make-up artist on titles such as The Sunday Times Style. Finding himself dissatisfied with beauty alone, however, Gok decided to pursue his love of clothes as a fashion stylist. Sixteen years on his talent and tenacity has seen him build up quite a pedigree: he has worked with some of the world’s most renowned photographers (Rankin, Mike Owen, Tony McGee, Jason Joyce, Elise Dumontet and Arthur Elgot), had his work published internationally (Glamour, The Face, The Times Style, Cosmopolitan, Afisha Mir and People Magazine US), amassed an enviable celebrity client-base (Bryan Ferry, Dawn French, Jennifer Saunders, Vanessa Mae, Damien Lewis and All Saints to name a few) and consulted on a host of television shows including GMTV (ITV1), Battle of The Sexes (BBC1), TV Book Club (Channel 4), Desert Island Discs with Kirsty Young (Radio 4), How To Look Good – With A Difference (Channel 4) and The Friday Night Project (Channel 4).